Pintado in Spanish means painted. 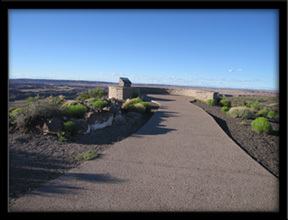 2.9 miles into the park and at 6,000 feet you are standing at the highest point in Petrified Forest National Park. This is said to be some of the cleanest air in the United States. You usually have a 120 mile view and can see the San Francisco Peaks near Flagstaff Arizona. In the foreground stands Pilot Rock just 7 miles away. Note: If you have an RV or larger trailer avoid this turn out due to the tight space in the parking lot. This entry was posted in National Parks, Petrified Forest and tagged Arizona, Petrified Forest National Park, Pilot Rock, Pintado Point, San Francisco Peaks, scenic overlook. Bookmark the permalink.